Okay, this will be the first of my Virtual Writing Seminars. I may not do them in order, but I’ll tag and number them all and number them for easy access. For those who didn’t read the description in my last related post, this is My Writing Process. I get asked at conventions a lot to delve into how I do things, I assume because people are having trouble getting started or getting hung up in the middle and want to know how someone who has completed 9+ novels keeps himself on track. When he said this he was speaking of those people at parties and other social events that you meet and they always say “I’d love to be a writer”. Then do it. It’s the only career in the world where there is no interview, no requirements, no education criteria, and no hours. It’s beautiful like that. Being a paid and published writer is another thing entirely. Being a successful writer is another thing again, but if your goal is simply to write then sit down with your pen and paper and just do it. And if you find that you sit there for days and can’t even get one sentence out… Well, maybe writing is for you what skiing is for me: an enviable thing I just cannot do. But I doubt that’s the case. Most people are writers simply because most people are storytellers, so I guess the goal here is to get you to write steadily and write well. No matter what I’m working on, I always start with a plan. When Ken Tam and I work together on our writing seminars, we usually liken this plan to a jackhammer: something big that should only be used at the beginning, and should be discarded if it later threatens the body of your work with it’s force. Even then, there are different levels of planning. For the Black Womb series there is, on one level, an intricate level of planning. Because events in one book are deeply affected by another there had to be. For that series I bought a supply of steno books and planned each CHAPTER of the series. These plans can be as loose as a simple description or as tight as having actual dialog and shot-for-shot events in them. Six-to-ten chapters would typically make a novel, but Black Womb books are typically short, so twenty would likely be a better guideline. Still, nothing wrong with a short novel. With Infinity the planning went different. As I was writing it with a co-author (Ellen Curtis), it wouldn’t have been fair to plot and plan everything. It also wouldn’t have been logistically possible, not knowing what was going on with her characters and pages. Instead I planned the characters themselves. This wasn’t a writing excersize so much as acting one. I got into the head of each of my characters and figured out their voice and back-story, then when it came time to put them in scenes together they acted naturally and it was like I was just transcribing the movie in my head. There’s another single novel I’m still in the plotting stages on where I’ve combined the first two elements and made it so that I know everything that will happen to each individual character, but where their stories cross is up to me when writing. That story may never be written, but we’ll see. So as you can see, there’s no one way. Ellen uses post it’s with notes scattered across her writing room. Some people use thought mapping (something I personally despise, but you go crazy). Some people (again, Stephen King) claim they don’t plan at all… And with some novels I believe him. Whatever way you choose, make sure it’s fun for you and that it doesn’t discourage you from the writing process. Let me know how you do, post YOUR planning methods if you have any, and happy writing. Okay, so I just finished the third of three short stories for an upcoming, unnamed Engen anthology, and it really got me thinking about the nature of the short story. Sometimes when I’m writing a short it’s less about story and more about atmosphere, which isn’t the way I normally approach things. I’m usually of the mind that character, above all else, comes first; then plot, and then wherever the chips may fall. But as I write more and more short fiction I’m learning that these rules are often very different between the two. Anyway, this was a short I’ve been itching to write for some time called Revving Engen. It’s kind of a prologue to the entire Engen Universe of stories, and takes place during what I’ve started to call ‘Black September’… In that both Infinity and Black Womb seem to have started around the same time in September. Anyway, hopefully it’ll be good. Can’t wait to get some feedback on it. I believe it’s due out in April. We’re getting a host of great authors for this collection. Currently on the list include myself, Ellen Curtis, Jay Paulin and Sarah Thompson. There will be more, we’re just waiting on first drafts to announce. Engen Books author Matthew LeDrew (Black Womb, Roulette) leaked information recently regarding the highly-secretive project, Infinity, while appearing on the first episode of Sci-Fi on the Rock TV. 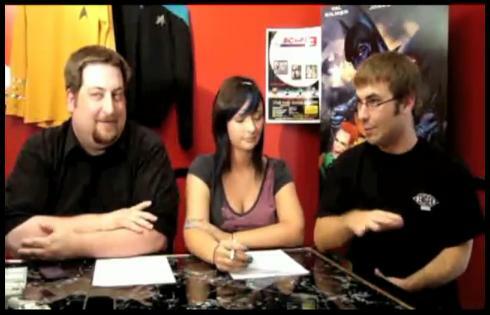 Sci-Fi on the Rock TV is produced by Hann Made Productions and features hosts Steve Lake and Ellen Curtis.